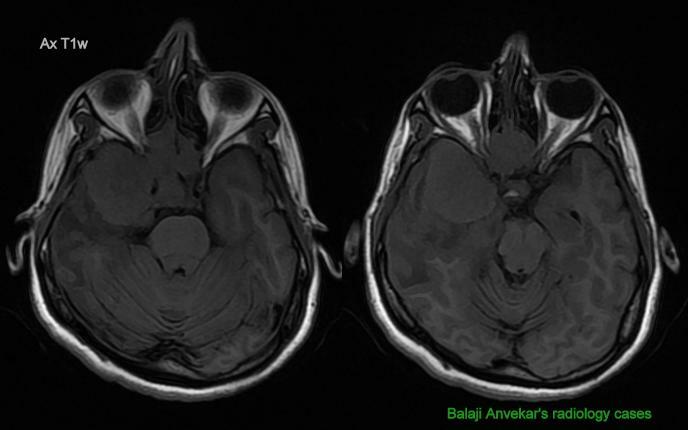 A 55 yo male with right side III, IV and VI CN nerve palsy. Non diabetic. 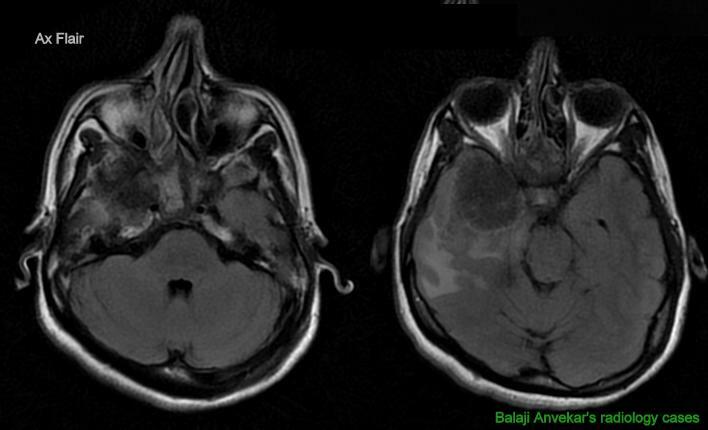 Here is his MRI Brain, Axial T2, FLAIR, T1w images with single voxel MR Spectroscopy. PC T1w images not available. A lobulated soft tissue signal intensity well circumscribed but locally invasive mass in right parasellar region, signals are hypo intense on T2w images with T2 hyperintense marked perilesional vasogenic odema in adjacent right temporal lobe. Right side ICA encased. Right side cavernous sinus obliterated explains involvement of CNs traversing through the right cavernous sinus. Destruction of floor of right middle cranial fossa near sphenoid sinus with a similar signal intensity soft tissue occupying right half of sphenoid sinus, rest of the sphenoid sinus show marked mucosal thickening. On single voxel MR Spectroscopy, peak of lactate at 1.3ppm and raised choline at 3.02. Absent peaks of NAA and Creatinine implies to non Glial origin of tissue. Locally invasive skull base Neoplasm. Histopathology : Aggressive Fungal infection.